Stupid politicians and people would go to any length to criticize Major Leetul Gogoi or the Army and Armed forces for the on the spot live saving actions and bravery. 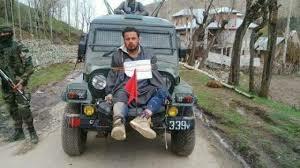 Major Gogoi saved an electoral office and local police by taking a stone thrower as a shield. If this was not done, all 3 would be dead? Is that what these politicians and liberals enjoying a good live in safe zones asking for? Would these people like to live in these war zones for some time?